LONDON (Reuters) - British lawmakers will have the opportunity to vote on up to three proposed changes to Prime Minister Theresa May's Brexit plans on Thursday, the Speaker of the House of Commons John Bercow said. 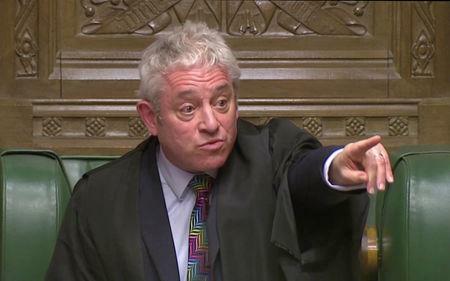 Bercow said he had chosen an amendment put forward by the opposition Labour Party which calls on the government to give parliament either a vote on a revised Brexit deal or a debate on the next steps by Feb. 27. He also selected an amendment which calls on the government to seek a delay of at least three months to the March 29 exit, and one which calls on the government to publish its analysis of the impact of a no-deal Brexit on business and trade. Voting on these amendments will take place one by one from 1700 GMT. Each vote takes around 15 minutes and the result is read out in parliament.